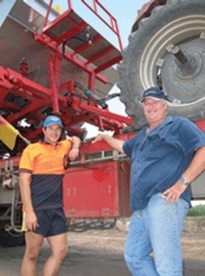 Farming in the Herbert River region for more than 90 years, Stephen Accornero’s family has seen a lot of advances throughout the sugarcane industry over the years. Since his grandfather cleared land at Abergowrie to grow sugarcane in the 1950s, before the returned soldiers’ settlement package, the family farm has grown from one farm to three, and has significantly increased tonnages. Now the Accornero’s combined farms at Forest Home, Abergowrie and Bambaroo harvest about 36,000 tonnes in a normal year. Today, Stephen, his wife Annalisa and their son Brenden run the family company’s on-farm and off-farm operations, with the help of one full time worker. A growing business, Stephen says originally they expanded the family farm by buying out other neighbouring cane farms as they came onto the market, and also then slowly developing the cattle property into a cane farm. “It works as we can work on one farm when it is raining on another,” says Brenden. Stephen says Annalisa is an integral part of their business, and in addition to working as a finance officer for Rabobank, she provides invaluable advice on-farm. “Annalisa didn’t grow up in farming but she is on the ball when it comes to any of our financial decisions about borrowing. She has the capacity to view things from an outsider’s perspective,” says Stephen. “Being a finance officer, she deals with a lot of businesses outside the industry – bananas, cattle, horticulture – so she has a different outlook on what other people are doing to maintain profitability. “Sometimes it puts me out of my comfort zone but it’s good for the business. Stephen says they also complete SWOT (strengths, weaknesses, opportunities, threats) analyses on new ideas.